When you have pain, probably last thing what you want to do is exercise. But did you know that disuse and inactivity can lead a muscle loss and joint stiffness by causing even more pain and discomfort? Researches have shown that proper exercise is crucial in managing arthritis and pain. It reduces stiffness and pain, builds strong muscle around joints and increases flexibility, joint stability and control. Most importantly, proper exercise can help lubricate joint surfaces, build and provide nutrition to cartilage and decreases inflammation. Motion is really a lotion! One of the most suitable exercise forms for arthritis is Pilates. Pilates exercises strengthen deep stabilizer muscles which support your joints and provide joint protection. Pilates exercises taught by an experienced Pilates instructor can also help reduce your joint stiffness and maintain/improve joints range-of-motion and a proper joint alignment. Posture and proper spine and joints alignment are very important part of treating arthritis as well as preventing further joint degeneration. As you probably know, poor posture put excess pressure on your joints, ligaments, muscles and tendons by causing more pain and joint wear and tear or even arthritis. Very unique about Pilates are Pilates machines (reformer, trapeze table, wunda chair) which are designed to work your body in a safe and controlled alignment. Those machines are spring loaded which makes them very “joint friendly”. Pilates apparatus together with a knowledgeable instructor help you work your supporting muscles around your painful and inflamed joints without aggravating them. And the facts that Pilates works your body as a whole and all exercises are low-impact, low resistance and should be performed in pain free range, make it even more suitable for people with arthritis. If you consider Pilates a part of your arthritis treatment plan, it is important to work with experienced Pilates Instructor or Physical Therapist. An effective Pilates program has to always be customized for your specific needs and conditions. Breathing is something that everybody does, it’s automatic and we don’t need to think about it. However, breathing is actually a pretty complex process that involves many joints and muscles and is responsive to both voluntary and involuntary control. For people with asthma, however, breathing has a total different meaning. 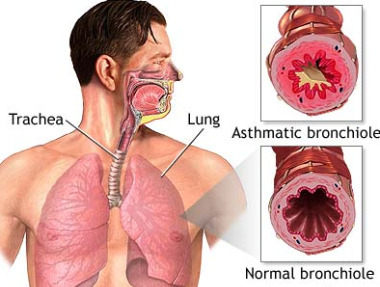 Asthma causes airways to become blocked or constricted and that causes wheezing, coughing and dyspnea (shortness of breath). Pilates exercises, with specific Pilates breathing technique, is a good and efficient way to control the breathing and get more awareness of it. Joseph Pilates himself had asthma as a child and he obviously got his own interest to create his exercise method around a proper, controlled breathing and mind-and-body connection. The Pilates breathing, also called lateral breathing, encourages optimal movement of rib cage and increases its mobility, and helps also correctly contract and expand core muscles, which all are very important for people with asthma. A proper, effective lateral breathing is fundamental for all Pilates exercises. Unfortunately, some instructors don’t understand the importance of proper breathing technique while teaching Pilates. A correct Pilates breathing is a key to proper muscle contraction as these two functions go hand in hand. Pilates private sessions with experienced Pilates instructor are very beneficial for Asthma clients to improve not only controlled breathing and better ventilation but the overall functional capacity for daily life, occupational & recreational activities and sport.